More than half of all Australians "could be served addressable TV tomorrow", according to Roy Morgan research... and that's not including those with unconfigured smart TVs. The survey shows more than nine million people have technology that could be used to serve different ads "when broadcasters overcome the significant technical, data-related and investment hurdles that remain". Additionally, "phenomenal growth" of SVOD services such as Netflix and Stan and the iView 'catch-up' service of national broadcaster the ABC, which are addressable-capable but don't carry advertising, the pollster says well over 14 million Australians could be served addressable TV tomorrow. Netflix has just begun testing 30-second ads to promote new content. Roy Morgan claims the take-up of advanced digital devices across the marketplace means more than 95 per cent of Australians technically have addressable TV capable devices that for whatever reason are not currently configured for the service. But broadcasters are only just starting to mature their own technologies and data stacks to be able to leverage connected devices to deliver personalised advertising. Source: Roy Morgan Single Source: January 2016 - June 2018. Average quarterly sample n=12,533. Australians aged 14+. Services with the potential to deliver addressable TV already used by more than million Australians include Foxtel, Foxtel Now, Foxtel on Demand, Fetch, Google Play, 9Now, SBS on Demand, TENplay and 7Plus. Others with the potential to deliver addressable TV that don't for business reasons include Netflix, Stan, ABC iView, Quickflix, Ozflix, Bigpond movies, Dendy Direct, iTunes (movies & TV shows), Sports streaming, YouTube Premium and Amazon Prime Video. Roy Morgan chief executive Michele Levine says the rise of digital advertising has provided a huge disruption to the media industry and traditional broadcasters are now fighting back and upgrading services to take advantage of new technologies: "The rise of digital advertising has dominated the media landscape in recent years. It now represents a majority of the $16 billion+ Australian advertising market up from virtually nothing two decades ago. "The attraction of digital advertising has increasingly revolved around the ability to advertise directly and to selecting targeted consumers with one-to-one marketing that traditional media has until now been unable to offer. 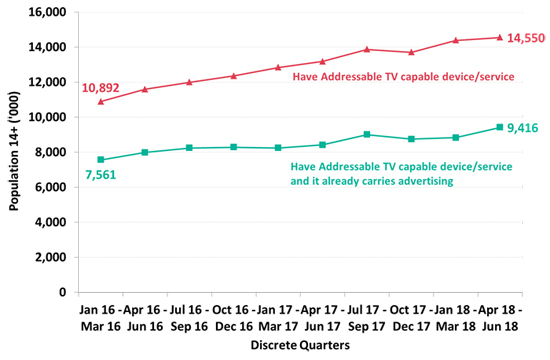 "The driving force behind 'Addressable TV' advertising technology is that it allows traditional media, and most particularly Australia's TV broadcasters, to identify and target individuals and households based on specific criteria and deliver tailored advertising - just like digital advertising does." She says addressable TV gives traditional Australian commercial TV broadcasters such as the Nine Network, Seven Network, Network Ten and Pay TV provider Foxtel the potential to "compete on a level playing field" with newer digital competitors such as Netflix, Amazon, Facebook and YouTube. "The increasingly fast rate at which Australians adopt a multitude of new technologies does give great hope to traditional broadcasters developing addressable TV as a viable competitor to newer digital-centred services. Australians have shown an increasing willingness to try out new technologies and all the evidence from the marketplace shows that if done correctly addressable TV can be a formidable step forward for traditional broadcasters." Roy Morgan lists these devices and services, including apps, which are technically able to carry addressable TV and which it measures in detail: Foxtel, Foxtel Now, Foxtel on Demand, Netflix, Stan, Quickflix, Ozflix, Fetch, Bigpond movies, Dendy Direct, Google Play, iTune (Movies & TV Shows), Sports streaming, ABC iView, 9 Now, SBS on Demand, TENplay, YouTube Premium, Amazon Prime Video, 7 Plus, 9Now, BBC iPlayer, Freeview FV, AFL Live Official App, Footy Live (AFL), Racing.com, YouTube, plus Australians with Smart TVs, smartphones, Games consoles such as Xbox, Playstation & Nintendo, Apple TVs, Fetch TVs, Google Chromecasts, Rokus, T-boxes, Telstra TVs and TiVos, and those who pay to access sporting events on demand, pay to access movies on demand, do shopping and access information on goods and services through my TV, make video calls through my TV, use my TV to access the internet, use my TV to download apps and set up my TV recording via the internet.